Larsen Virtuoso® strings are a true innovation, offering a hitherto impossible blend of extraordinary sound volume with only moderate string tension. With Virtuoso we are also redefining musical qualities like subtlety and clarity as ideals for sound. These strings let you achieve a nuance in sound unprecedented with standard synthetic core strings and you will experience an astonishing string re sponse and ease of playability. The Virtuoso® E string is made using a unique carbon steel, while the A, D and G strings build on a new, pioneering synthetic multi-filament core. The A string is wound with precision rolled aluminium flat wire, the D and G strings with pure silver. We offer Larsen Virtuoso® strings in two tensions, medium and strong. Virtuoso® medium and strong are both somewhat lower in tension than their conventional equivalent gauges. The medium tension strings show extraordinary string response, playability and sound modulation capability. The strong version is more focused in sound, more soloistic, and with higher resistance to the bow. Virtuoso® strings are a great choice for dark to neutral sounding instruments where they offer a beautiful, warm sound with great projection. And, given their moderate tension, they lend particular benefit to older instruments. Larsen Virtuoso strings are clean and loud but with a feel and playability of a warm synthetic string. I would put this set up against a Thomastik Vision, or an Evah Pirazzi as far as tone goes but having a lot more flexibility. If your instrument is relatively dark sounding but cannot handle a lot of tension these are the perfect strings for you. These are some of the best strings I've tried. I like them better than Dominants, but Obligatos are still my favorite. Although the first few days they don't sound the best, they only sound this way for 3-4 days. I did not use the E string out of this set. I actually used a kaplan E string. 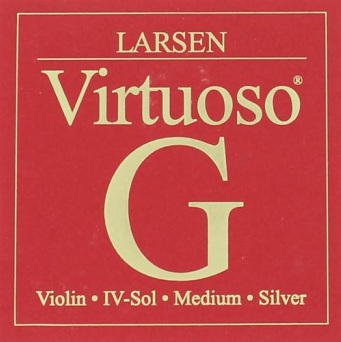 Larsen Virtuoso Violin Strings are a bright projecting string, but they aren't too bright. What I like about these strings is that they have a lively sound, but have a sort of warm sound to them. The sound stays that way until the strings go bad which will then sound dead and lifeless. I've had these strings for 4 weeks and they still sound the same. E string - I didn't try it, but I did like the Kaplan E string with this set. A string - It's a good string, but to my ear has started to go false after a few weeks. However, I do play a lot so your experience may be different. D string - It's a good string. Definitely not the best, but I enjoy playing on it. G string is warm and doesn't choke in high registers. Like the D string, I enjoy playing on it. 2. I like the brilliant but warm soloist sound. 3. I would consider using these more if the A string lasted a little longer for me, and if the price was lower. I judt don't think the price is all that worth it like it is for the Obligatos. With all the information on this wonderful website and a little tip from a friend I gave the Larsen Virtuoso Medium a try. First of all I must say that I`m still a beginner. My instrument is a Yamaha V7G originally stringed with Helicores. My teacher and I always thought that they were okay.They are quite warm, but the E-string hurts the ear. And the A-String doesn't ring really well. Stringing my violin with Virtuosos meant a total liberation for the instrument. They are really loud and complex at the same time. Furthermore they have a very soft feel with the left hand. I was quite surprised to see that the G, D and A strings are much thicker than those of the Helicore set. But it took me only minutes to get used to this fact. The E-string is bright, but not too bright and doesn't whistle at all. What I like most about the Virtuosos is that all four string have a velvety complex sound with easy response and they ring really well without exception. I fitted a set of Larsen Virtuoso for the first time replacing a rather worn Vision Titanium Solo set on a powerful Wulme-Hudson violin. Settled in quickly with surprisingly little extra tuning needed and the tone is warm with good projection and rich overtones on all strings with a particularly bright E string. The downside is that the open E is rather prone to squeaking particularly in chords and as I am due to play some solo Bach in a recital I will replace the E with a Vision Solo which does not have that tendency. It will be interesting to see how long the rich overtones last. The Vision strings only lasted a month at their best. These are fantastic strings. Right from the first hour they produce beautifully layered, long ringing tone. Higher up the fingerboard their merit becomes even clearer, compared to neighbouring strings (I happened to have Violino, Larsen standard, Vision and chromesteel Obligato A next to the Larsen Virtuosos). I have not tested the Virtuoso E yet. with the G, D and A I am very happy. I tested them on a 2011 built 7/8 violin and a ca. 1900 violin strung CGDA. They are my favorite strings now, for both violins. For the longest time I have used Dominants on my old violin, so I thought it was time to experiment and I tried Larson's new Virtuosos. I used the medium tension and I was astounded by its complexity of tone. The sound produced is very dark, and it gives me chills. Though I do think the E string could have more bite, it is a good string. All the strings produce many different colours. One drawback; after only about two weeks of use, the D string starts to unwind on the bridge. I had my bridge checked out to see if that was the problem but it was fine. This has happened twice, and now my A string is starting to unwind in the first position. They are only about two months old, but maybe it is just how I play. Overall these are great strings and I love them!